Port Barton is a small fishing village located on a bay in the municipality of San Vicente in the Northern part of Palawan. It is still relatively unknown to tourists. The main beach, with its calm waters and a long stretch of sand, is surrounded by a pristine rainforest. You’ll like Port Barton’s simplicity and its people’s hospitality so much, that you’ll never want to leave. With an area of 923.26 km2 (356.47 sq mi) Port Barton is a small village in the municipality of San Vicente, located in the north-western side of the main island of Palawan. The wet season is from June to October. The dry season, from November until May. The recently opened airport in San Vicente town is the closest airport to Port Barton. The easiest way to reach Port Barton from San Vicente town is by boat. There are daily shuttle vans that run from El Nido to Port Barton and from Puerto Princesa to Port Barton. There are no bank and no ATM in Port Barton. Bring a sufficient amount of cash with you. Credit cards are rarely accepted. Internet access is limited and very slow. There is no electricity in Port Barton, except from 5:30PM till midnight. The average length-of-stay in Port Barton is 3 days. 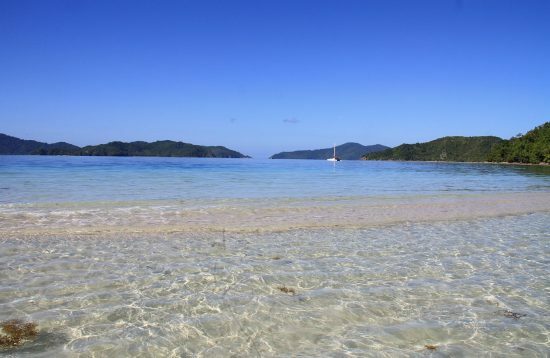 German Island: Crystal clear water, white sand beach, and a good snorkeling site a few meters from the island. Exotic Island: one of the most beautiful island in Port Barton composed of two islands separated by a narrow channel with shallow waters. Papuwyan Waterfall: this lovely falls with a gorgeous scenery are locate about one hour walk from the town. Paradise Island: a tiny island food for snorkeling and chill on the sun. It’s not very popular so you can have the entire island almost for yourself. The best time to travel to Port Barton is between December and early May. This is also the tourist’s peak seasons when hotels tend to be fully booked. The rainy seasons starts in June and lasts till October. August is the wettest month. Port Barton is not on the typhoon path. -Public Transportation: There are several shuttle van companies that offer a direct link between Puerto Princesa and Port Barton. Shuttle vans are daily and run almost every hour from 7.30am until 6.00pm. The journey from Puerto Princesa to Port Barton usually takes around 3-4 hours. -Private Transfer: Private van is the quickest and least hassle way to get from Puerto Princesa to Port Barton. -Public Transportation: With no direct link between Sabang to Port Barton, shuttle van are via Salvation Junction. Get Lexxus shuttle van that goes to Puerto Princesa and ask to be dropped at Salvation, where you can catch the connecting shuttle van Recaro or Nature Island to Port Barton. The journey is about 3 hours and 30 minutes, plus the stop in Salvation. -Private Transfer: Private van is the quickest and least hassle way to get from Sabag to El Nido. -Public Transportation: Shuttle vans from El Nido to Port Barton are daily and run two times per day. The journey from El Nido to Port Barton usually takes around 4 hours. 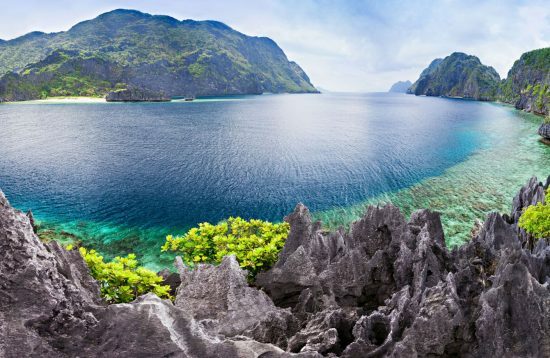 The tour package 8-day Palawan’s Natural Wonders starts from Puerto Princesa and include the visit of some of the most amazing places, such as the Underground River, Port Barton and the island of Bacuit Bay in El Nido. Most hotels and guesthouse are conveniently located a few steps from the beach and a short walk from the downtown. There aren’t any 5-star or luxury accommodation in Port Barton. Secret Paradise Resort & Turtle Sanctuary is Port Barton’s premier resort. The resort is set in one of the largest unspoiled secluded coves in Palawan (118 hectares), and surrounded by tropical forest. 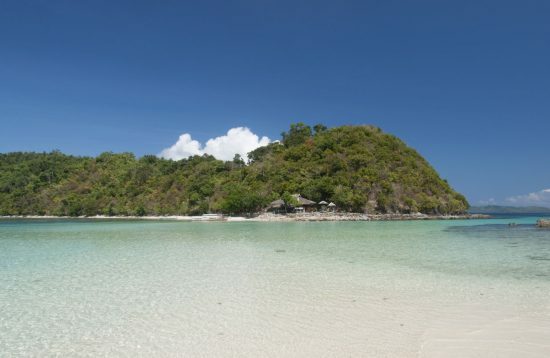 Blue Cove island resort is a simple resort with wooden cottages in the pristine Albaguen Island. It’s the perfect place to detox and experience nature’s beauty in the rich environment of Palawan. White Beach Annex Resort has only 8 rooms scattered around a huge isolated property with a private beach surrounded by tropical forest. Summer homes is a beachside accommodation in Port Barton. The resort offers high-quality accommodation currently consisting of 4 chalets and 7 rooms.